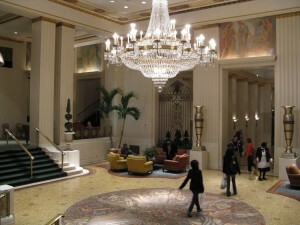 If there ever was a luxury hotel that embodies New York, it’s the Waldorf Astoria. Of course it’s a landmark luxury hotel, but it’s steeped in so much history that it’s difficult to talk about New York without mentioning the Waldorf. From Guy Lombardo’s annual New Year’s celebrations broadcast from the Grand Ballroom to guests including heads of state and Hollywood royalty too numerous to mention, the hotel has a long and storied past. Historically, The Waldorf is responsible for transforming the role of major urban hotels into establishments that do more than just provide temporary accommodations to travelers. These grand urban hotels were to become social centers in cities and prestigious destinations for visitors. The Waldorf was also at the forefront of advancing the status of women by being one of the earliest to admit women singly, without escorts. 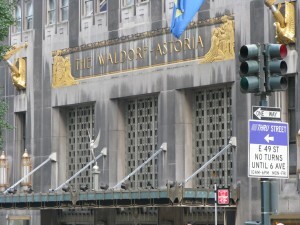 2016 UPDATE: The Waldorf Astoria may no longer be offering afternoon tea. 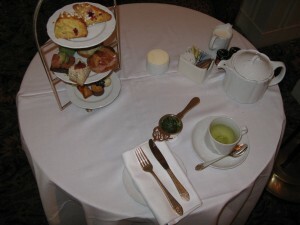 For all these reasons, I had to visit The Waldorf for their afternoon tea. It was a cool and overcast day in New York and trying to get crosstown in Manhattan was, as usual, a challenge. A note to the faint of heart – if you are stopped at a red light in Manhattan and the light turns green, you had better be moving in one-millionth of a second or else face a barrage of car horns. The traffic was like a vice. I arrived and entered through the Park Avenue lobby, a cavernous space that has recently been restored to the grandeur of its 1931 Art Deco design. This is 1930’s New York, preserved in time, yet updated and shiny for the 21st Century. Afternoon Tea at The Waldorf is served in the Park Avenue lobby or more accurately, the Cocktail Terrace surrounding and slightly above the lobby. As luck would have it, my table was right next to the “Cole Porter” piano. Cole Porter was a resident here from 1939 thru 1964 and often played this very piano. 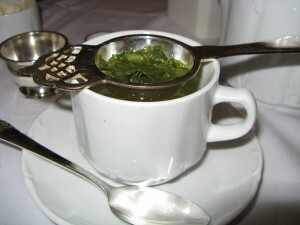 The Waldorf’s tea menu offers a selection of eight full leaf teas and two herbals. Don’t ask me why, but the Japanese Sencha green tea sounded good to me, and it turned out to be a wonderful choice. Brought out in a Seltmann Weiden teapot, it was delicate and light and just right on this cool November afternoon. Perched above the main lobby, you have the perfect vantage point to witness the comings and goings of guests and visitors entering and leaving this grand hotel – people watching at its best. You sip your tea, imagine Cole Porter serenading you on the piano, and watch the hustle and bustle of New York passing in front of you. However, since you are on the Terrace, an oasis elevated above the lobby, you can choose to ignore the activity below and simply enjoy the afternoon tea, if that is your preference. The three tier tray is topped off with buttermilk-currant scones that are served warm, and I would definitely suggest trying one while they’re warm. There are also small bits of sugar embedded in the scones, and they are served with Devonshire cream and strawberry preserves in jars. The tea sandwiches are delicious and include an apple wood smoked salmon with pickled cucumber that I enjoyed very much and a roulade of marinated fall vegetables that was excellent. The sweets included a light lemon chiffon, and a very good chocolate mousse. The service was attentive, yet not intrusive. When I needed to eventually depart for the airport, the check was brought to me quickly and with a smile. Now, if only Cole Porter would appear and have a seat at his old piano. Let’s see, we’re in New York – fabulous hotel – private oasis on the Cocktail Terrace – Cole Porter playing the piano, and afternoon tea – maybe next time? This entry was posted in North American Teas and tagged afternoon tea, high tea, new york, new york city, waldorf astoria. Bookmark the permalink. Hello to my Australian friends! Just to clarify, I am an individual and not associated with any specific hotel or afternoon tea venue. If you’re interested in booking an afternoon tea in NYC, I would suggest you contact the hotel directly. Cheers! It’s been a few months since I had afternoon tea there, so I’d recommend contacting them directly to get the most recent pricing. You can reach them at (212) 755-1200.